Heat oil in 12-inch nonstick skillet over medium-high heat. Cook turkey in oil 3 to 5 minutes, stirring occasionally, until brown. Stir in stir-fry vegetables. Cook 2 minutes, stirring occasionally. 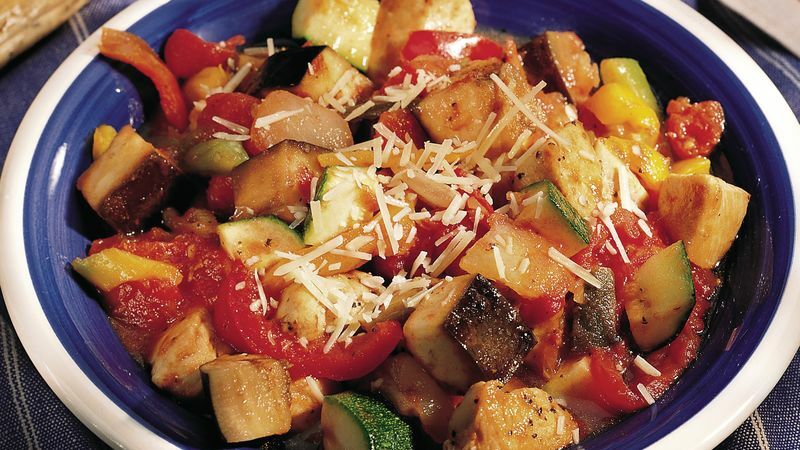 Stir in eggplant and zucchini. Cook 2 to 4 minutes, stirring occasionally, until vegetables are tender. Stir in tomatoes; reduce heat. Cover and simmer 3 to 5 minutes, stirring occasionally, until sauce is desired consistency. Sprinkle each serving with cheese. Go vegetarian! Skip the turkey, pepper and oil and steps 1 and 2. Add 2 cans (15 to 16 ounces each) garbanzo beans with the tomatoes in step 4. It’s that easy!